Floors The Flooring Foundation - | Our Floors : Search the options for the best flooring. Timber floors from Godfrey Hirst are made from real wood. 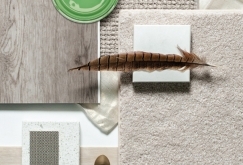 Providing natural style and durability, look no further than Godfrey Hirst timber flooring. Bamboo flooring is easy to clean and maintain and is one of the fastest growing hard flooring options. Godfrey Hirst bamboo floors also feature 'glueless' installation. Hybrid flooring uses Trigon® Core Technology, an evolution in flooring with the visual appeal of timber and combines the attributes of laminate and vinyl to produce a truly unique product. Our matte finish flooring choices have the lowest level of shine and reflection across our ranges. A Satin finish allows products to have a greater degree of shine and reflection than a matte finish but not the full shine of a gloss. A gloss finish provides the highest level of shine and enhances your space with a striking, polished effect.